The group's boundless range and appeal has resulted in one of the most diverse touring schedules in the music industry. Whether at an opera house, symphony hall, campus, church, corporate or community event, or aboard a cruise ship, Chapter 6 is right at home. Opera houses are often repeat clients, while the Association for the Promotion of Collegiate Activities' audiences named Chapter 6 "Entertainer of the Year" (2005). Chapter 6 has performed theatrical pops programs with over ten major metropolitan symphony orchestras in association with The Symphonic Pops Consortium, yet returns to the intimate classroom where the group has conducted over a hundred master-classes for high school choirs. Finally, their Christmastime concert is a favorite among churches and arts venues offering holiday programming. Chicago's excellent Contemporary Christian sextet Chapter 6, who we have enjoyed on the stage at the Harmony Sweeps Finals, have a poised, strong, jazz-flavored CD in "Christmas time." 12 songs, notably the light, scatty "Sleigh Ride," a Chanticleer-like arrangement of "O Come, O Come Emmanuel," a surprising scatty Manhattan Transferish arrangement of "Hark the Herald Angels Sing," a rap-flavored "This Christmas," a blue-note "Away in a Manger," a jazzy, driving "Carol of the Bells," surprising, hip vocal percussion arrangements of "O Little Town of Bethlehem," "Rise Up Shepherd and Follow," a moody "Gabriel's Message," a blue-note "The First Noel" and a stunningly jazzy "White Christmas." An unexpected, but impressive Christmas album for very talented Chapter 6. These seven talented guys from Chicago, six vocalists and one arranger, started singing together at Illinois' Milliken University, where they won the International Championship of Collegiate A Cappella in 2001. They were 3-time winners of the Chicago Harmony Sweeps Regional before finally being named National Champs in at the Finals in San Rafael, CA in 2004. 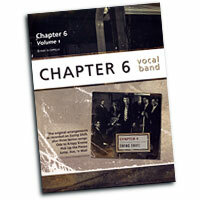 Chapter 6 was also featured on American Idol Season 7 in conjunction with bandmate Luke Menard's "Top 16 run." 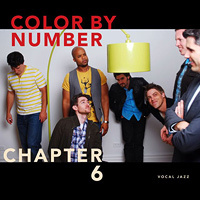 Taking regular breaks from their extensive touring schedule to record, new release "Color by Numbers" is their 7th excellent album, in addition to a live DVD and a songbook. There are 14 recordings of fan favorites here, including the jazzy, scattish "Rainbow Connection" and manic, swingin' "Harold's House of Jazz," the very funny "Reverb" (sung to the tune of "Fever"), great faux horns and vocal percussion on "Interlude I (I Dream of Jeannie)," a breezy, sweet lead and new arrangement of Lennon/McCartney's "Penny Lane," a salsa-flavored arrangement of "Pure Imagination," a brilliant, funny Swingle Singers take on "James Bond Meets the Sugar Plum Fairy," a pair of short, yummy Interludes, "II (I'm Looking It Up Online)" and "III (Invention);" A bluenote, rainy-day jazz arrangement of "Let's Stay Together," a finger-popping original, "Left-Handers Unite!," a surprisingly hip arrangement of "Fairest Lord Jesus" and a lightly piano-accompanied vocal symphony of "Rhapsody in Blue" that is a soulful, harmonic tour de force! We had another chance to be thrilled by a set from Chapter 6 at the recent 2002 Harmony Sweeps National Finals (which was amazing), and these seven good-looking young men from Illinois almost won it all! They actually won 3rd Place, but were a close second in the voting for audience favorite to Champion Perfect Gentlemen. An impressive live set: "Istanbul," "Overjoyed," the hilarious country song "Fat Lady," "I Wrote This Song," "Change In My Life," a very funny "cover" of Rockapella's "Folgers" ad, an equally funny ode to "Krispy Kreme" donuts, written while the group waited to perform at the Chicago Harmony Sweeps Regional, the beautiful "Come Unto Me" and "And They Praised God" (reminding us that we do list Chapter 6 under "Contemporary Christian"), the swing classic "Jump, Jive & Wail," "The Rootbeer Song," Queen's "Bohemian Rhapsody" (which wowed the crowd at the HS Finals), and closing with AWB's "Pick Up the Pieces." This CD captures Chapter 6's brilliant sense of humor, great stage presence, top-drawer vocal abilities and winning arrangements. Watch out for this group at next year's Finals - very possibly walking off with the whole enchilada! In addition to the gift of a thrilling and funny performance that won (against a very strong field of Regional winners) the 20th Annual Harmony Sweeps National Championship in San Rafael, CA, Chicago's talented all-male sextet Chapter 6 brought us a hot new CD! Happily, the three pieces that they performed at the finals, "Theme and Variations on 'It Don't Mean a Thing if it Ain't Got That Swing'" (which won for Best Original Arrangement), the hilarious 5-minute "Wizard of Oz," and even their encore performance (as Audience Favorite), "The 7th Wheel," which introduced us to the singing of their arranger, sometimes composer and sound engineer, Mark Grizzard. Grizzard also wrote the opening piece here, a fast-paced jazz number, "It's About Time." Rounding out the 11 songs are a nice Stevie Wonder cover, "Don't You Worry 'Bout A Thing," the BeeGee's hit "How Deep Is Your Love," the Gospel song "God's Love," an uptempo "What A Wonderful World," the very funny "Lost In Canada," James Taylor's "Your Smiling Face" and the bluesy "I'll Take Care of You." These guys are consummate entertainers, they have big fun on stage, and they can sing like angels. Like Chapter 6 at the Finals, "Swing Shift" is a hands-down winner! We have had a number of memorable opportunities to become major fans of Illinois-based, 7-man Chapter 6 since their founding at Decatur, IL's Millikin University in 2001. They were Harmony Sweeps Chicago Regional Champs 3 times, giving us dynamite live sets at the Finals, where signature tunes like "Ode to Krispy Creme," "Bohemian Rhapsody" and "Wizard of Oz Medley" led to standing O's and their being named National Champions in 2004. "With The Windows Down" is the sixth Chapter 6 recording in the PAC catalog, each of them featuring the group's cutting edge arrangements and flawless a cappella harmonies. The first of our favorites of these 12 tunes are a pair of mellow originals written by Mark Grizzard, master arranger, "There I Go" and "Highway," and one by Nathan Pufall, the poignant "I Wanted to Say." Then we have to choose several Grizzard-arranged covers, "Pinball Number Count," "Change the World," the best version of Lennon/McCartney's "Eleanor Rigby" we've heard, Marvin Gaye's "Mercy Mercy Me (The Ecology)," Sylvester Stewart's 5th Dimension hit, "Hot Fun in the Summertime," "Peg" and the soaring, delicious "Clocks." Rich harmonies, deep, powerful, "walking-bass" vocal percussion, perfect, spirited leads-this is a cappella heaven from a group that simply keeps getting better at what they love to do. 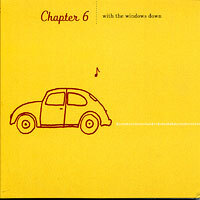 "With The Windows Down" is a joy from the first cut to the last! We feel like we know these 7 personable young men from the Chicago area very well. 3-time winners of the Chicago Harmony Sweeps Regional beginning in 2000, they have been onstage regularly at the National Finals, finally winning the whole enchilada in 2004. The liner notes for "In Concert" are about as minimal as they can be-some nice small stills from the DVD on the front, and then a listing of the songs on the back. 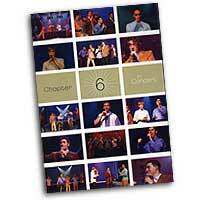 This seemed curious until we realized that the DVD is aimed at people who have seen Chapter 6 in concert or heard one of their 4 excellent CDs, people like us. We don't need breathless prose to convince us about how wonderful the group is, we know that-let's just get this packaging open, and-cool, there's 2 DVDs, one with 17 hits, and the other with behind the scenes footage. It's all here, Stevie's "Don't You Worry 'Bout a Thing," Freddie's "Bohemian Rhapsody," "Theme and Variations on It Don't Mean A Thing if It Ain't Got That Swing" (which won Best Arrangement in 2004), "Ode to Krispy Kreme" and the hilarious, brilliant 5-minute "Wizard of Oz" that absolutely won them the Finals and drew them another standing O at the A Cappella Summit that year. Great stuff all the way through, and we have to say, stardom couldn't happen to a nicer bunch of guys!